Few cities anywhere are as vibrant, historically rich, and just plain fun as New Orleans. But it's not a "dummy proof" destination. Too many travelers leave town wondering what all the fuss is about. That doesn't happen to those carrying this book. 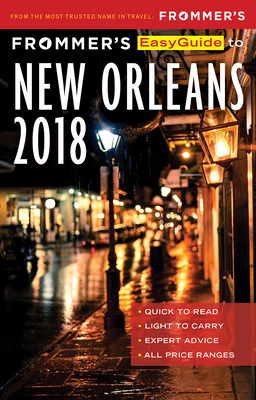 Written by local journalist Beth D'Addono, Frommer's EasyGuide to New Orleans introduces travelers to the experiences other visitors miss; and has the type of insightful commentary on the iconic sights that brings them to life. The book includes special sections for those who are visiting during Mardi Gras and Jazz Fest; and day trips to nearby plantations and nature sights. Finally, there's exact pricing for every item in the book, along with transportation tips, to help make your vacation worry free. Beth D'Addonois a full time freelance food and travel writer head over heels in love with New Orleans, an affair she first began 25 years ago while living in Philadelphia. Unable to resist the city's magnetic allure, she moved full time to the Marigny neighborhood in 2012. Over the years, she has written countless articles, guidebooks and website content about all things New Orleans in publications including AAA Traveler, Cruise Critic and USA Today. A passionate supporter of the city's vibrant food, music and arts culture, Beth spends her non-working hours riding her bike, listening to live music, walking her dog Ruby along the river and in City Park and connecting with the particular New Orleans brand of magical realism that greets her every time she walks out of her front door. Her two most recent books are New Orleans The Hunt Guide (2015) and 100 Things To Do in New Orleans Before You Die (2016).